Bacon is delicious. This is known. Even if you don’t eat meat for any of the myriad (and valid) reasons, you know that bacon is delicious. It hits all of our major pleasure centers at once. It is salty, sweet, chewy, and fatty. These are the things that make the hardwired lizard brain that rests atop your spinal column very happy. The sad part is that so few people have ever even had REAL bacon (or remember it at least). 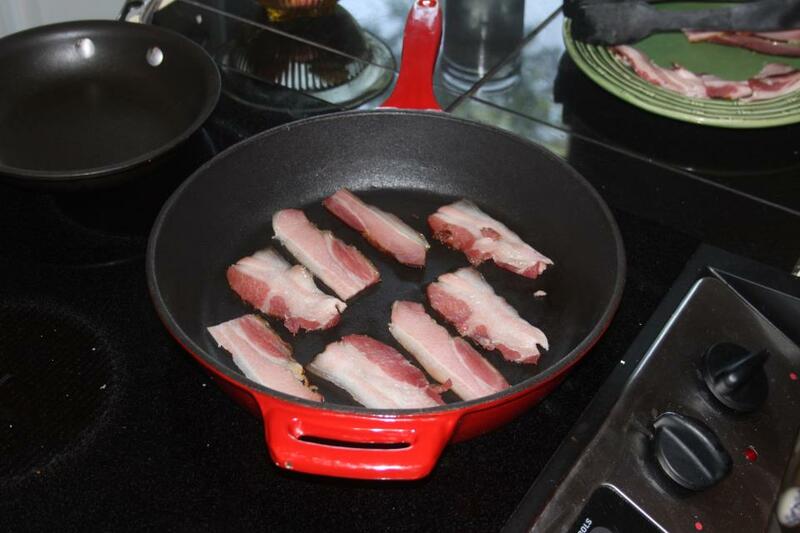 Today, bacon takes a long dip in liquid smoke and is injected with water. Not cool. Not cool at all. We bought a 5 pound slab of belly from a local farmer about seven years ago. I wanted to make bacon with it because I had read about it in a book called “Charcuteri” by Michael Ruhlman (buy this book!). That slab sat in my freezer for a solid two years. The whole process intimidated me, you had to plan ahead and thaw it, then cure it for a week! I couldn’t plan that far ahead. Finally, after smoking a few things here and there on my buddies smoker, I pulled out this poorly packaged piece of belly. It was freezer burned to all hell. 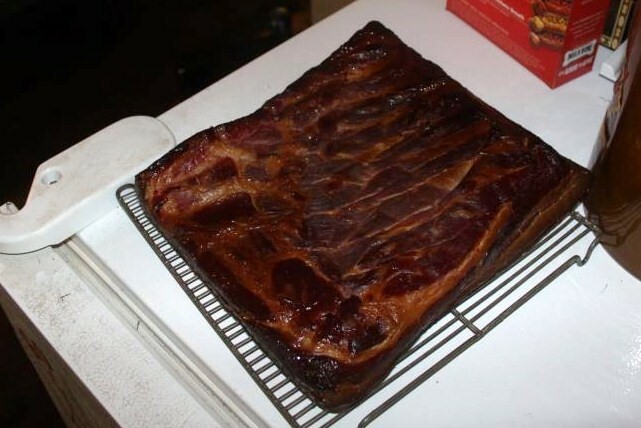 We turned it into bacon anyway, got the recipe wrong, smoked it too hot, then didn’t wait until it was cool to slice it. STILL…this was the best bacon I had ever eaten at the time. 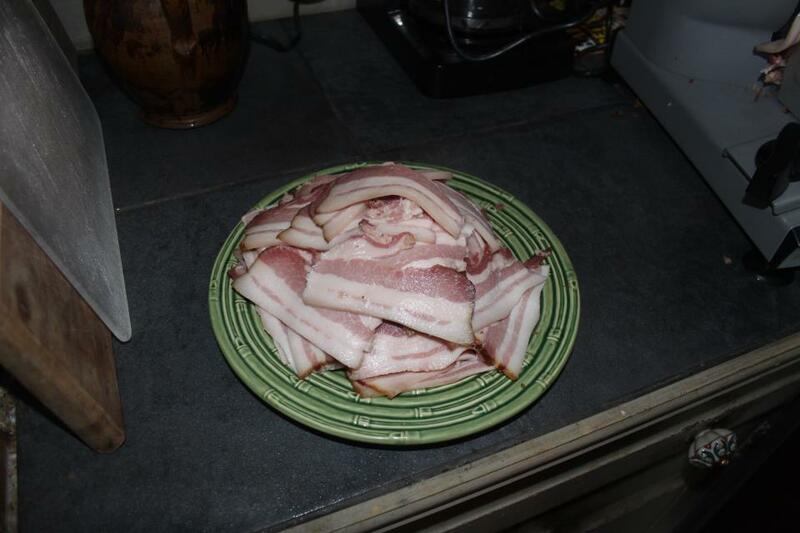 Even if you mess some things up, making bacon yourself will still forever alter your worldview. 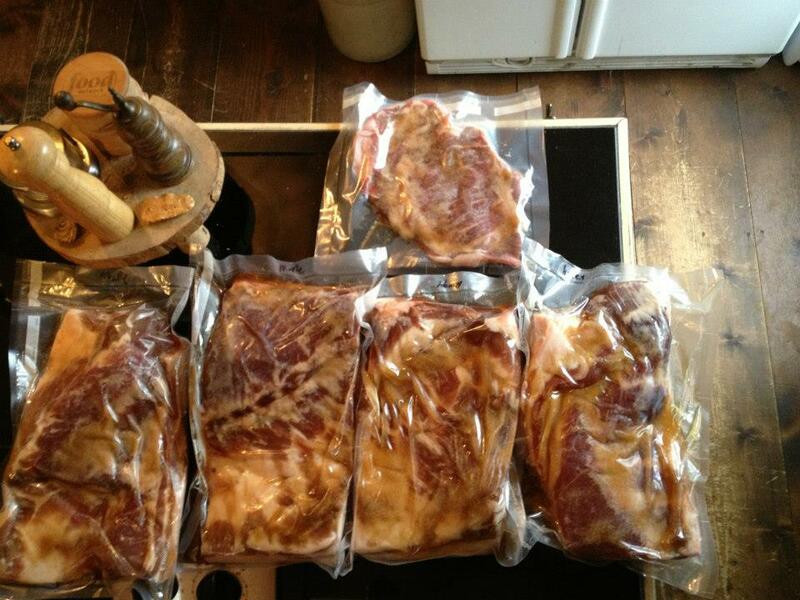 I have since made over 100 pounds of bacon. It’s safe to say I am no longer intimidated. Let’s get started! 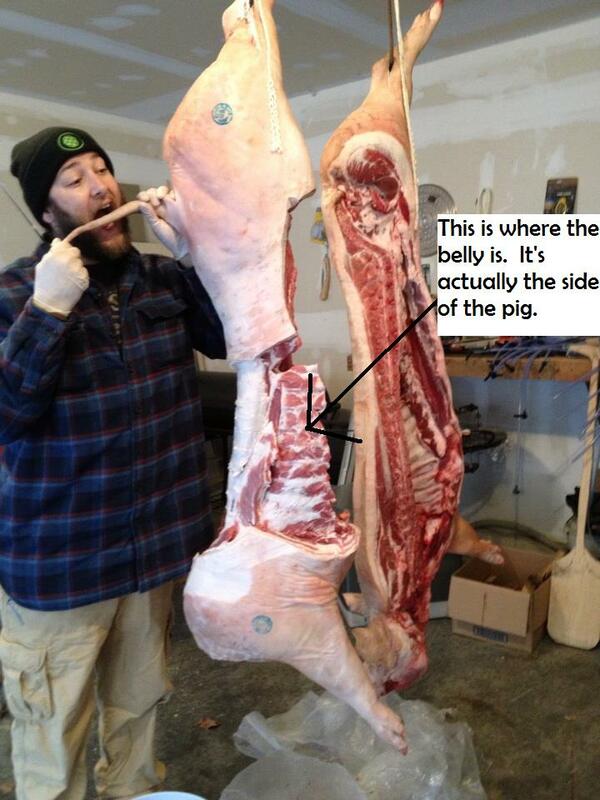 Go to you local butcher, farmers market or grocery store and ask for a 5 pound slab of pork belly. They may need to order this for you. No big deal. It is best to get this from a local farmer raising hogs on pasture, so spend a few minutes looking for one of those before immediately going the grocery store route. Everything else aside, happy pigs taste better and have better (and healthier) fat content. You can use regular grocery store belly though, that’s what all the major producers are using anyway, your’s will still taste much better. Belly chunks in cure, ready to be put in fridge. 1/4 cup brown sugar. Sometimes I use a little extra because I like it sweet. Those are the ingredients you need to make bacon. You can toss in whatever else you want….black pepper, crushed red pepper, garlic, thyme, whatever tickles you. Then rub this mixture all over the meat. cover it all up good, then slide the meat into a large freezer bag, vacuum seal bag, or a cookie sheet with tall sides (cover with saran wrap). tighten the bag down good on the meat and slap it in the fridge. Everyday it is curing in the fridge, I take it out, give it a bit of a massage, and flip it over when I put it back. You will notice liquid being pulled out by the salt. The belly is actually making its own brine. We are pulling water out, concentrating flavor, instead of injecting water like the mass producers do. Taken out of cure after a week. Meat is redder and more firm. Then, after the week of cure pull it out of the fridge and rinse it off well with cold water in the sink. If you used spice like black pepper, that will stay stuck to the belly, which is perfectly fine. Then pat it dry with paper towels and place it on a plate or drying rack for at least a few hours at room temp. This is fully cured now so it is perfectly safe to leave it out at room temp for 24 hours. you want the surface to be dry and almost tacky feeling (called a pellicle) so the smokes stick to it. Meat on the smoker. Sure, these are hams, but shaddup. Then smoke it for a few hours, skin side down. Leave it skin side down the whole time. I only smoke mine to about 120 degrees leaving it as a raw material, but many smoke it to 155, cooking it thoroughly. Cooking it hotter will cause some fat to melt off, so I cook mine lower knowing I will be frying it later. If you don’t have a smoker, you can easily build one, but even a cheap smoker will work great for bacon. Cooling down after coming off the smoker. 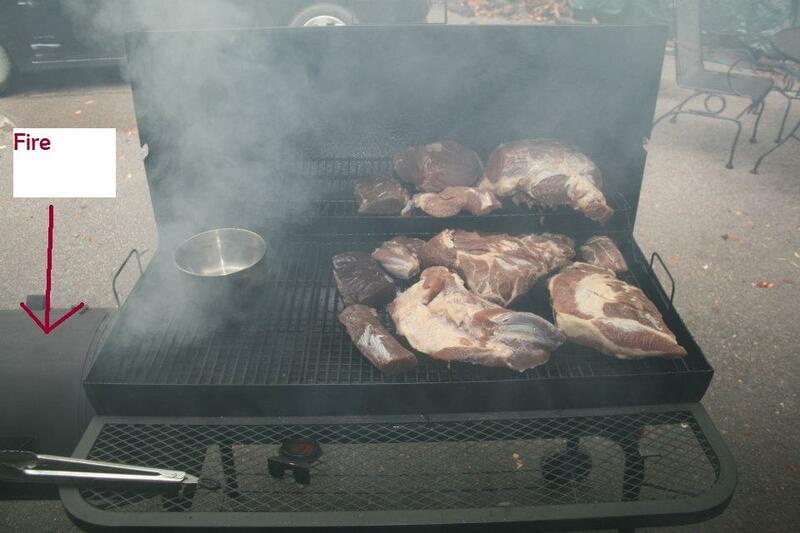 I smoke mine for 3-4 hours using hickory wood because I like it really smokey. After smoking, pull it off and let it cool back to room temp. This will take hours. Once at room temp, feel free to cut off a few thin “test slices”. To get a better slice on the bacon, I then refridgerate overnight. Once cold, I carefully cut off the skin and discard. Then I slice the whole thing into rashers while cold. Give it a shot, it will change your whole world. I promise! 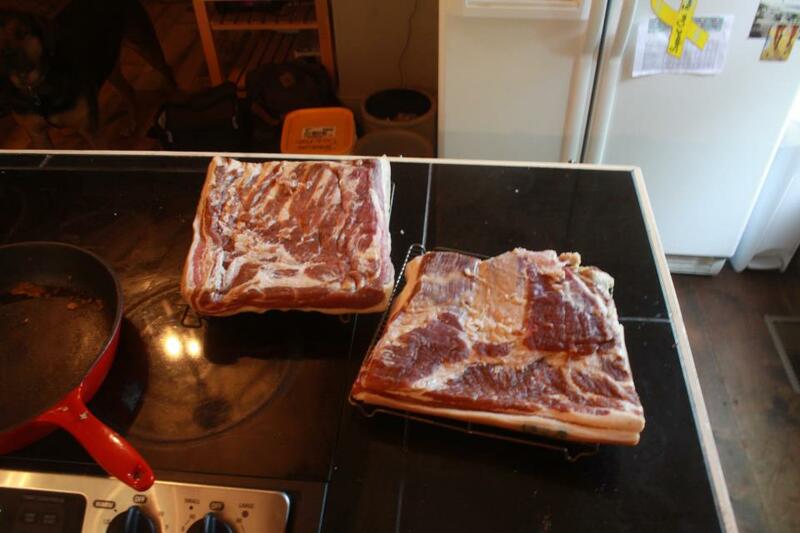 This entry was posted in Meat Stuff and tagged Bacon, Grocery store, Home, Meat, Michael Ruhlman, Pork, Pork belly, Smoking. Bookmark the permalink. 2 Responses to Makin’ Bacon! Sounds good! Might have to give it a go.